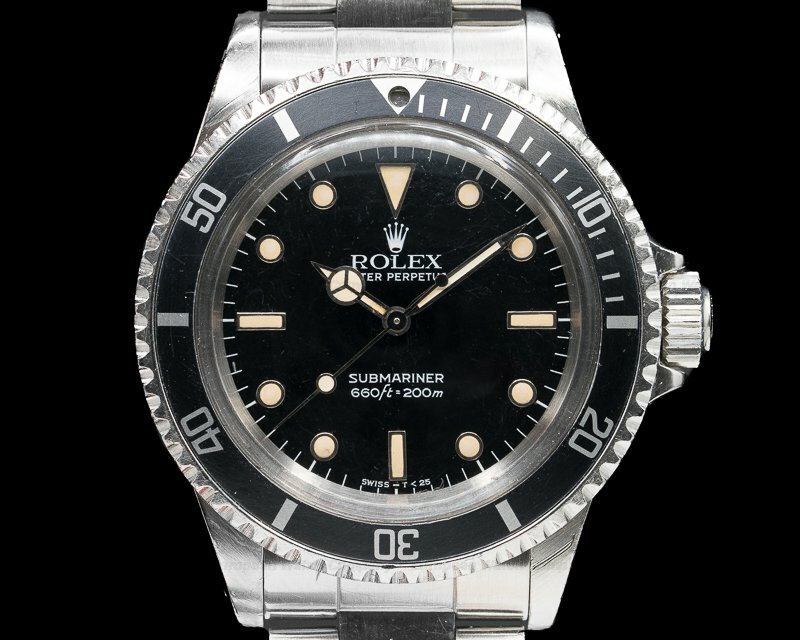 30494 Rolex Submariner 5513 "Meters First" Matte Dial, 5513, "Meters First" Dial, stainless steel on a stainless steel 93150 bracelet, automatic caliber 1520 movement, centered sweep seconds hand, bi-directional rotating bezel, screw-down crown, water resistant to 660ft, 170XXXX serial (circa 1967), fantastic matching patina on dial and hands, diameter: 40mm, thickness: 14.5mm. 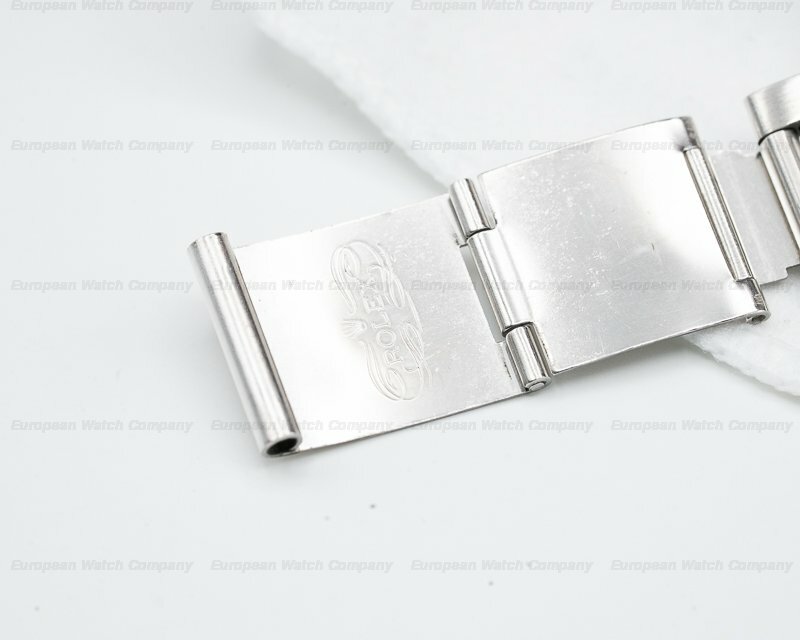 Excellent Condition with European Watch Company pouch Rolex Service Card. 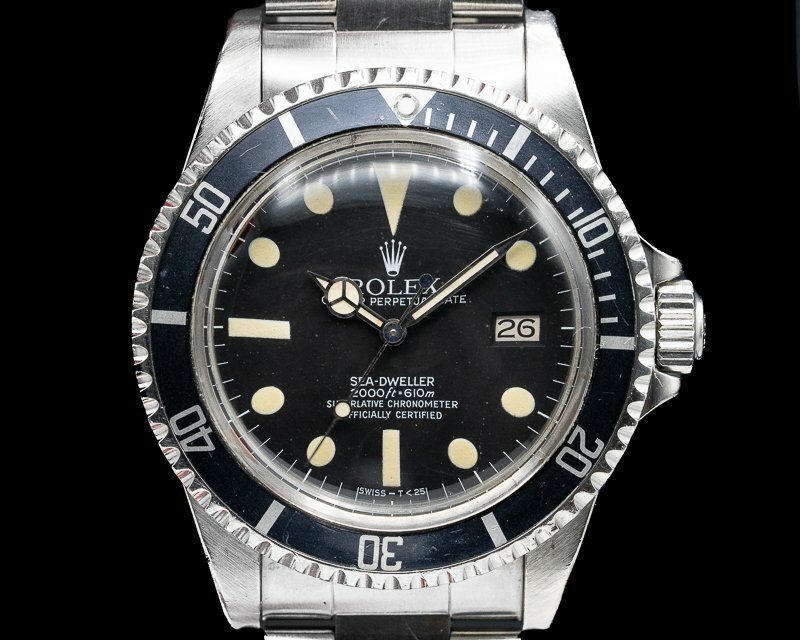 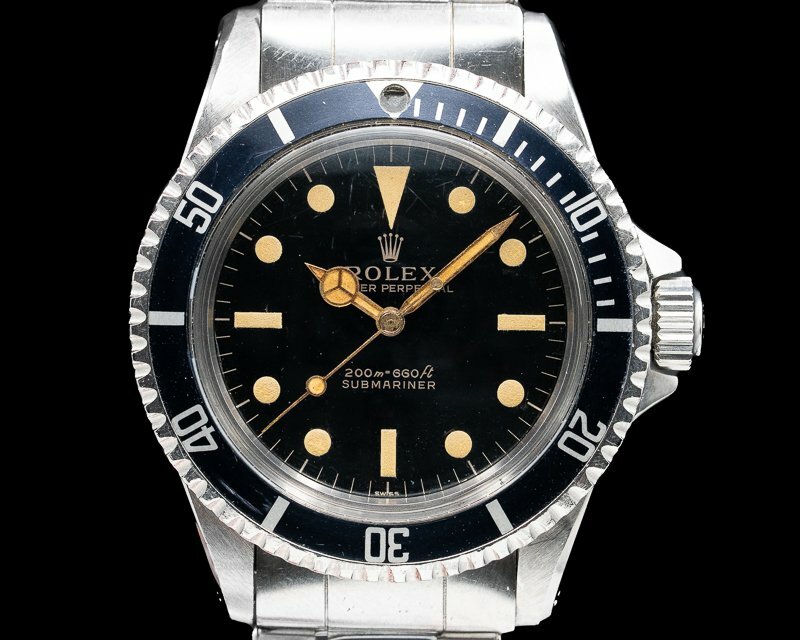 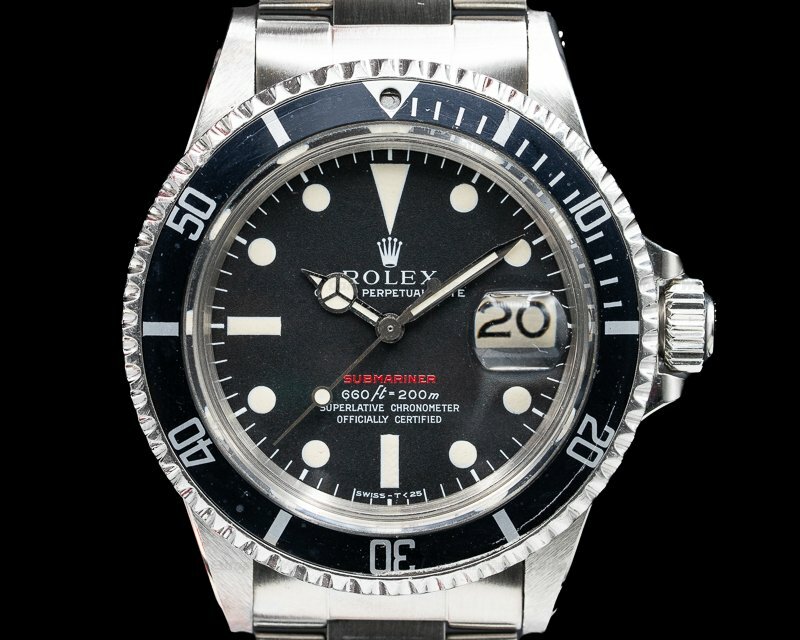 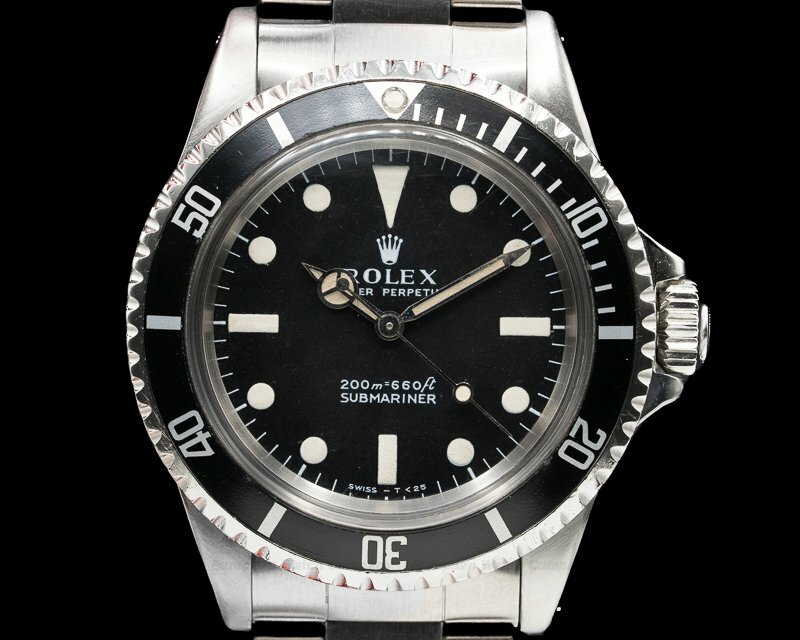 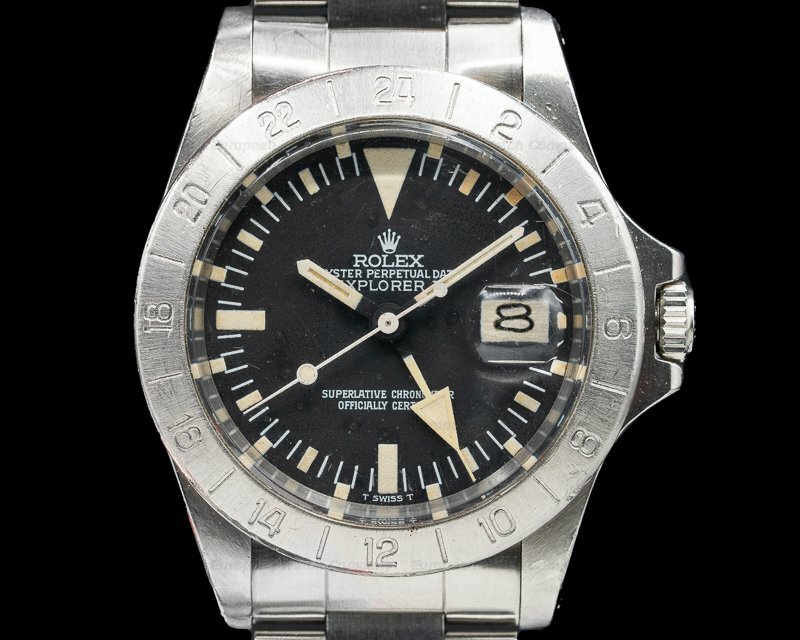 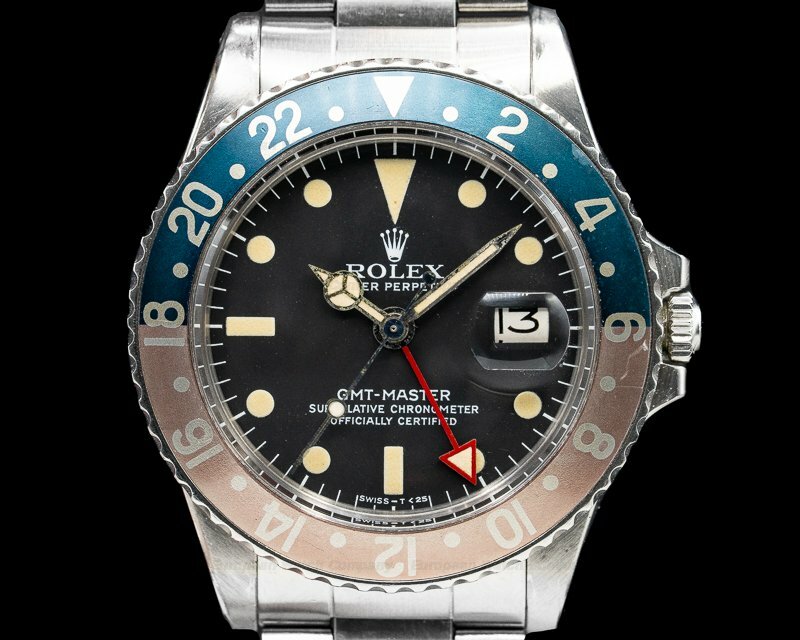 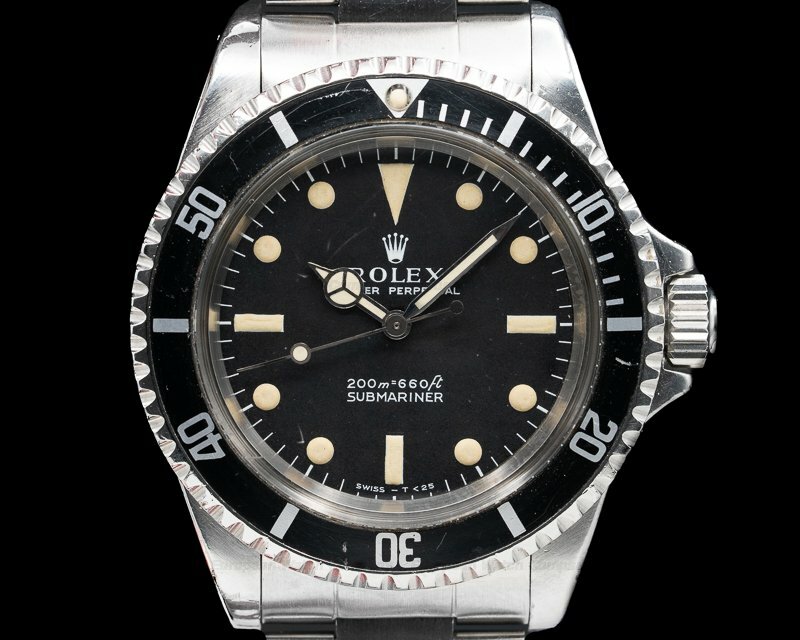 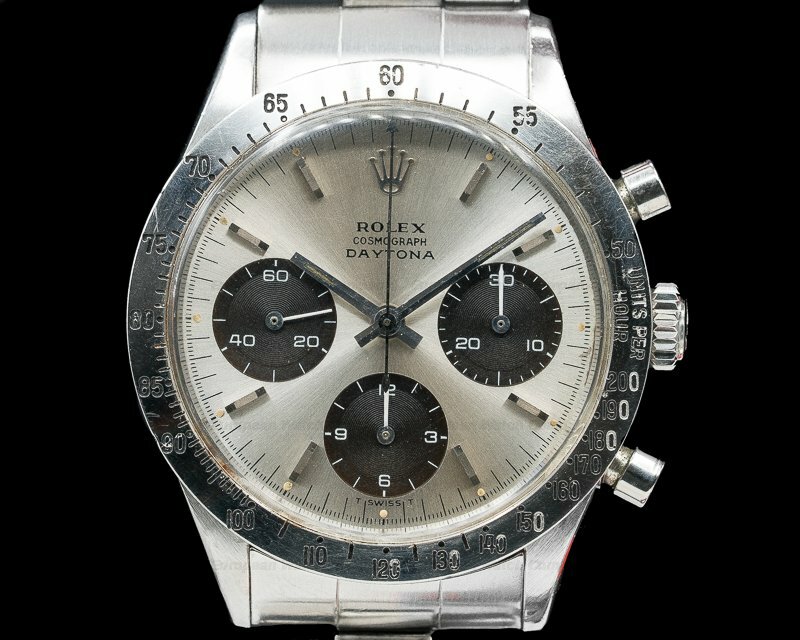 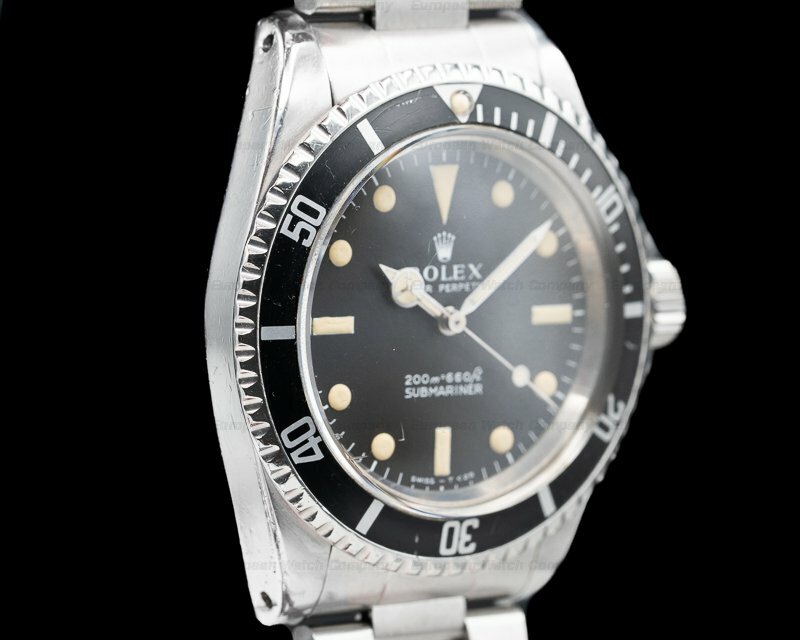 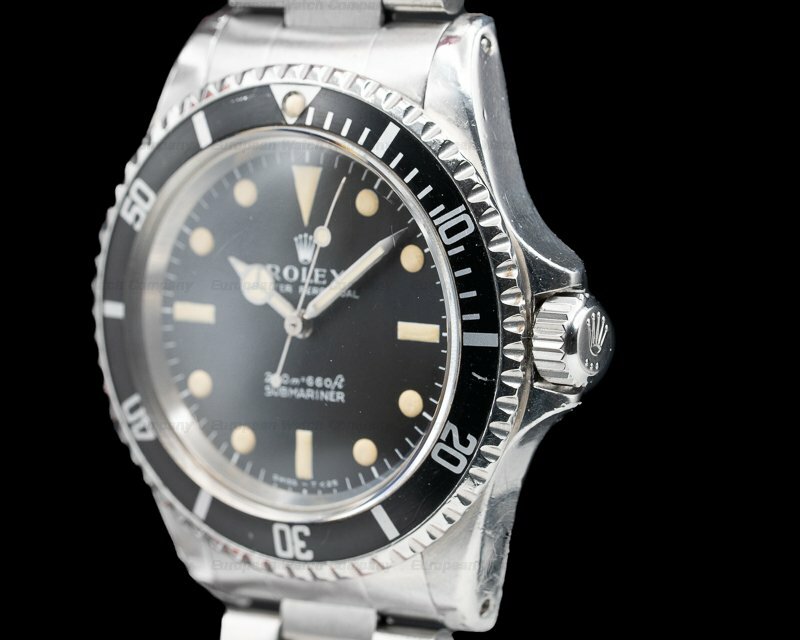 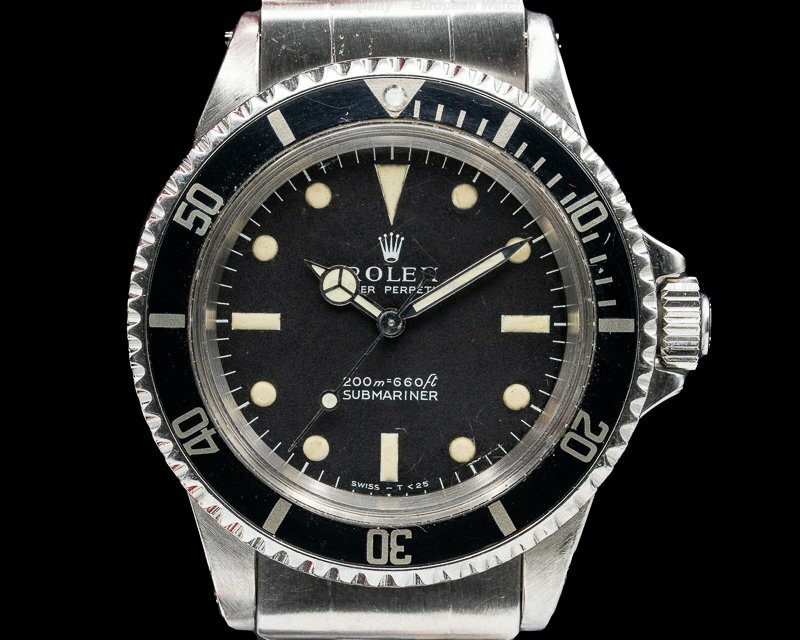 This is a vintage c. 1967 stainless steel Rolex Submariner "Meters First" 5513. 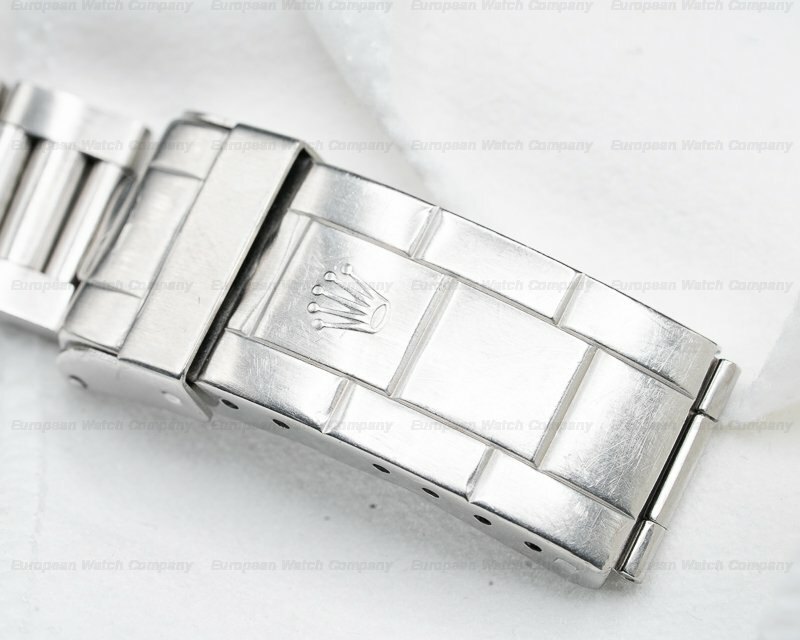 It has an integral stainless steel 93150 bracelet with a double folding deployment clasp, and a domed acrylic crystal. 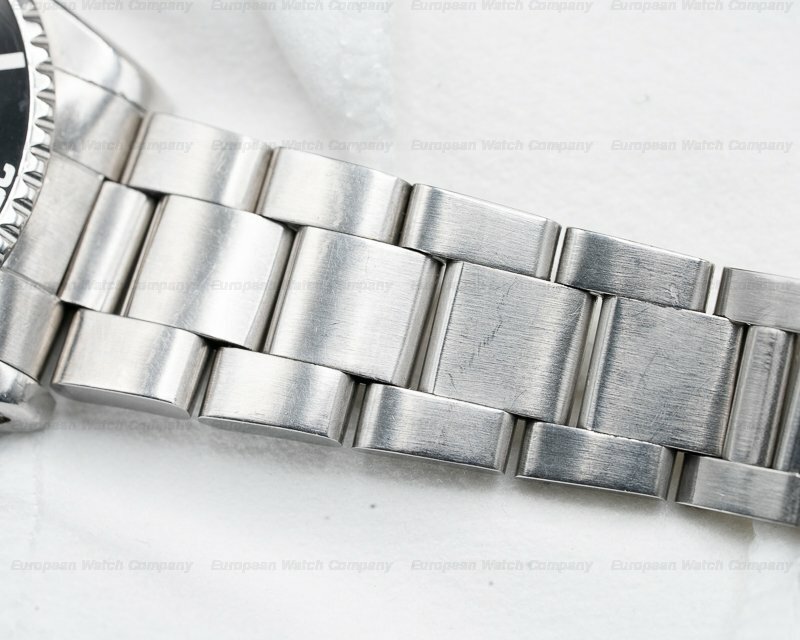 The 40mm diameter solid three-body case, knurled bezel, and downturned lugs are polished/brushed. 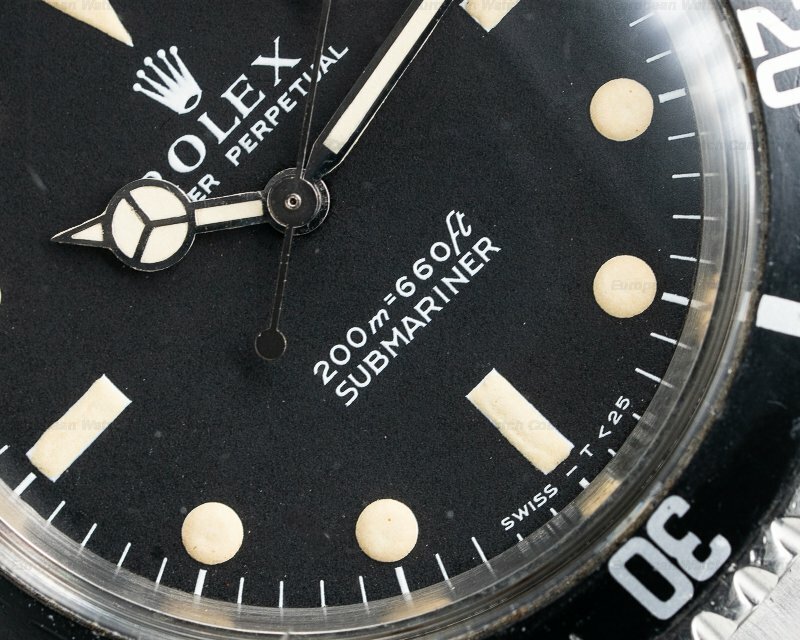 It includes a graduated bi-directional revolving black bezel for the decompression times marked in luminous Arabic numerals. 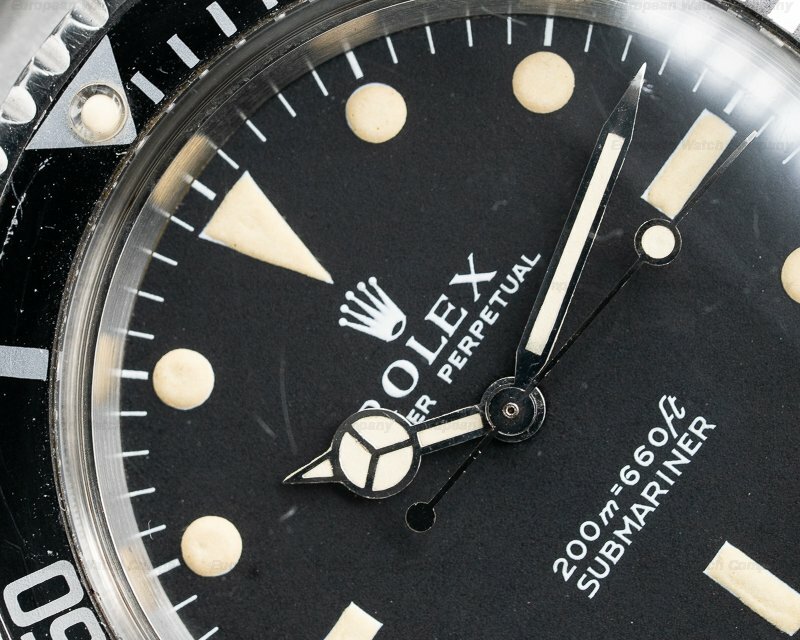 The "Meters First" black dial has luminescent round, triangular, and baton hour index markers, an outer minute track, luminous steel skeleton hands, and a center sweep seconds hand. 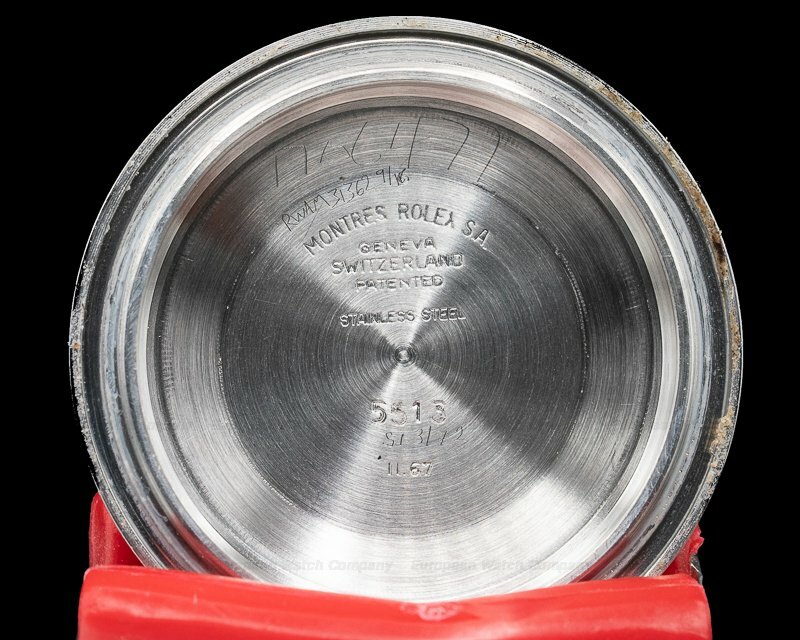 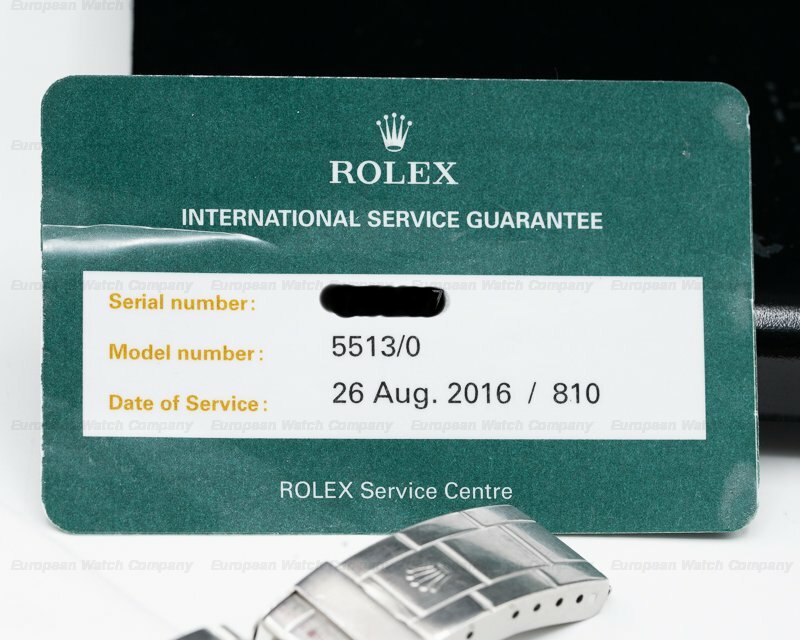 There is a screw-down solid case back and a protected patented Rolex Trip-lock winding crown with a crown guard. 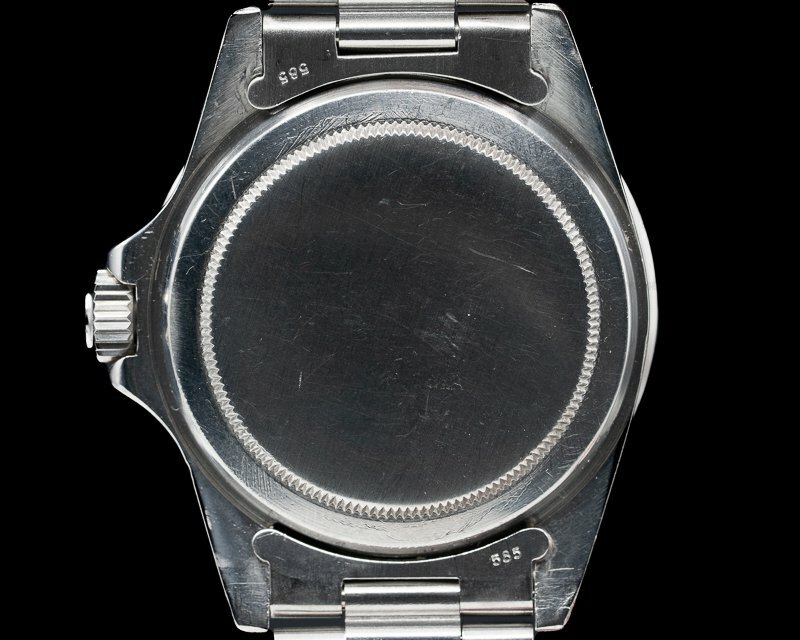 It's water resistant to 660 feet, and the 14.5mm thick case, dial, and movement are all signed. 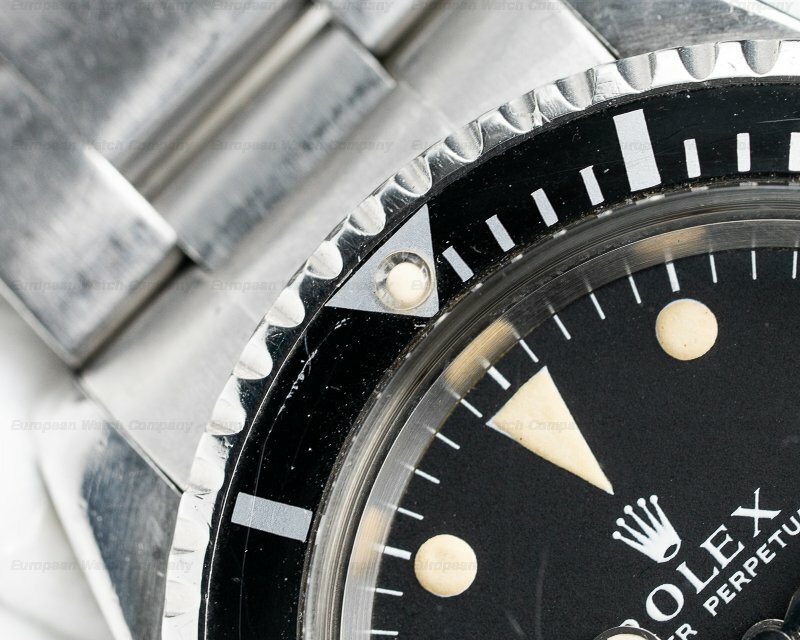 This Rolex Submariner "Meters First" dial 5513 has a mechanical automatic self-winding Rolex caliber 1520 movement that's rhodium-plated, and constructed with 26 jewels, and a shock absorber device. 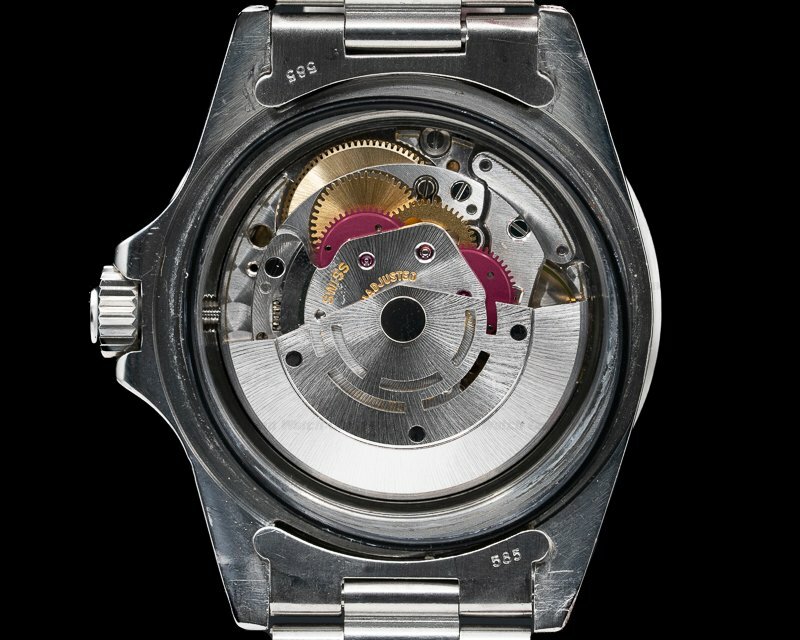 It includes a straight-line lever escapement, a monometallic balance that's adjusted for temperature and 5 positions. 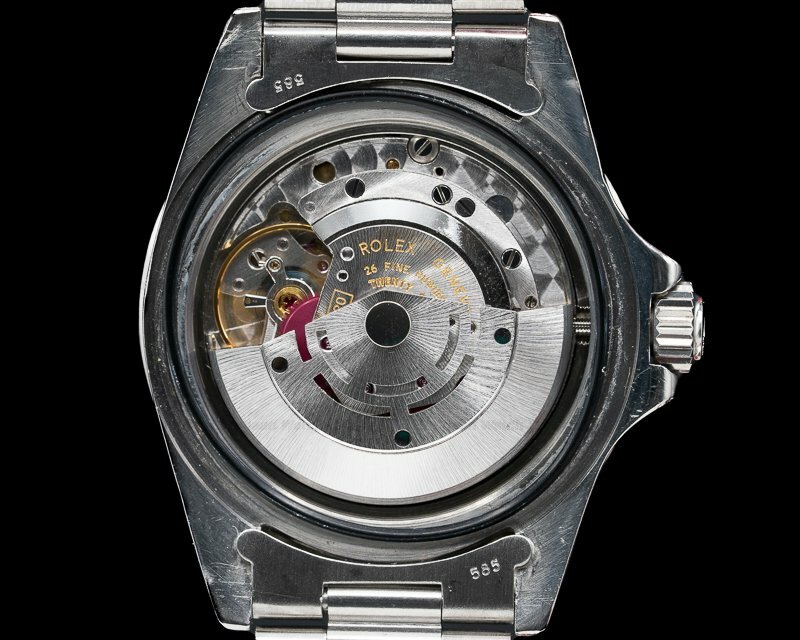 There is a self-compensating flat balance spring, and a central hacking seconds mechanism. 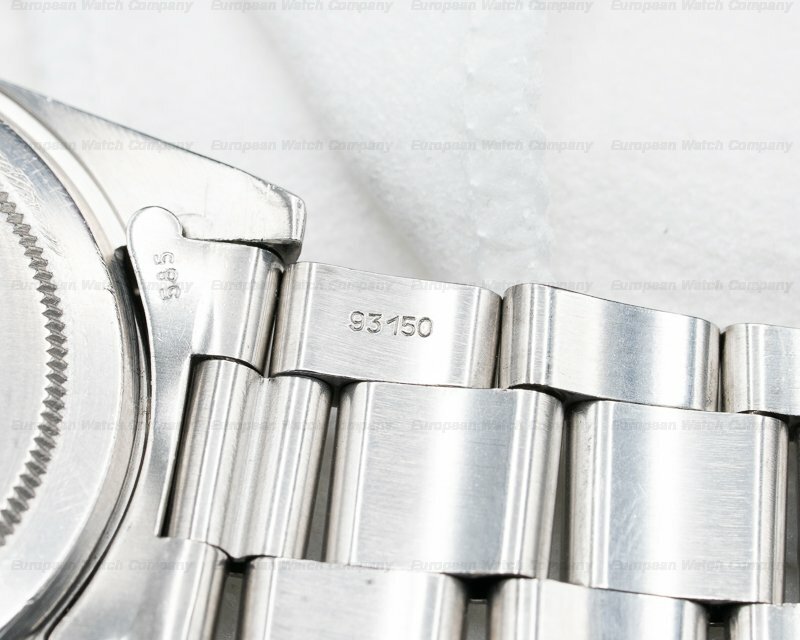 The movement oscillates at a frequency of 18,000 vph (2.5 Hz). 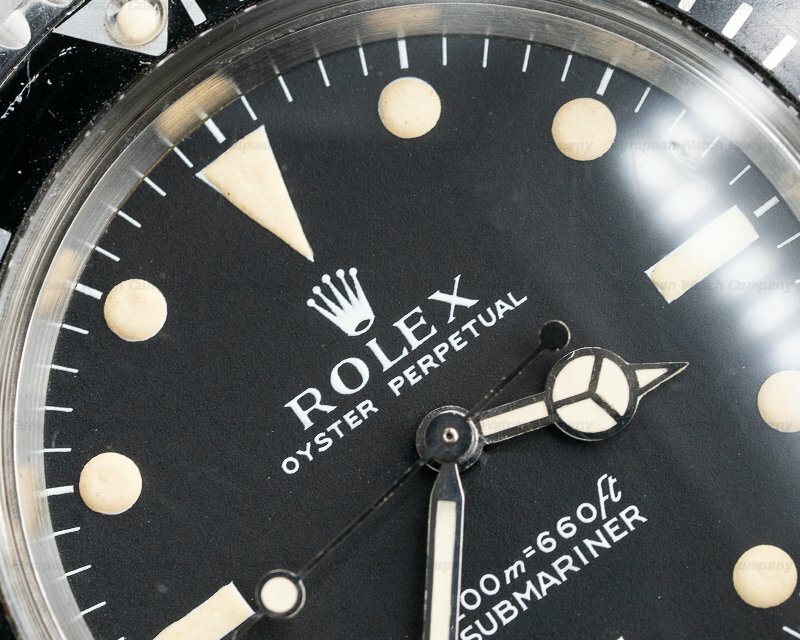 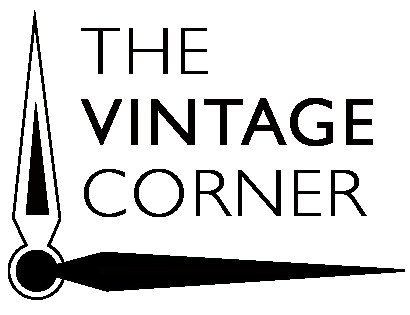 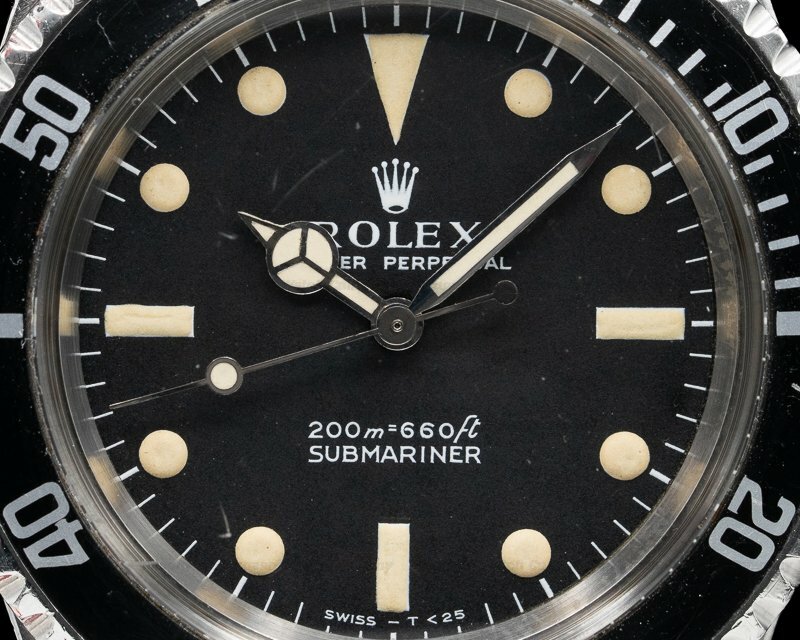 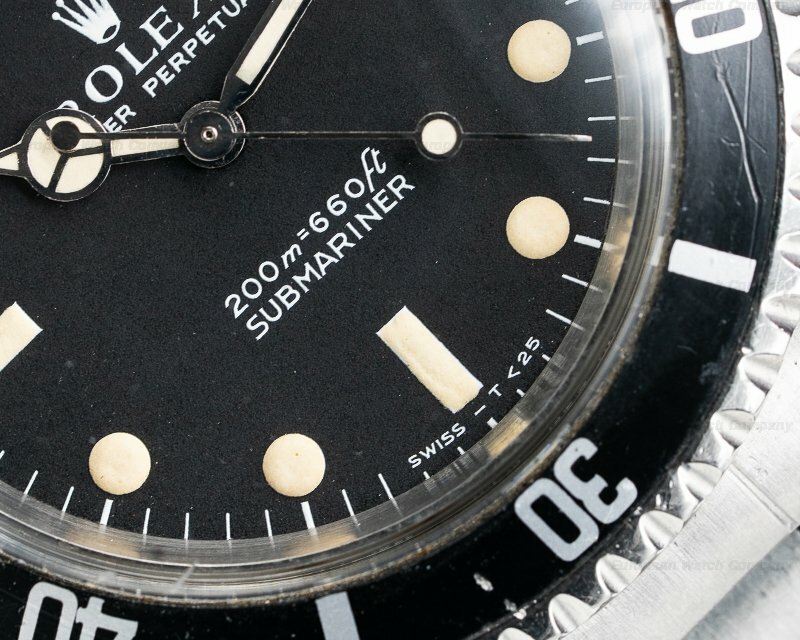 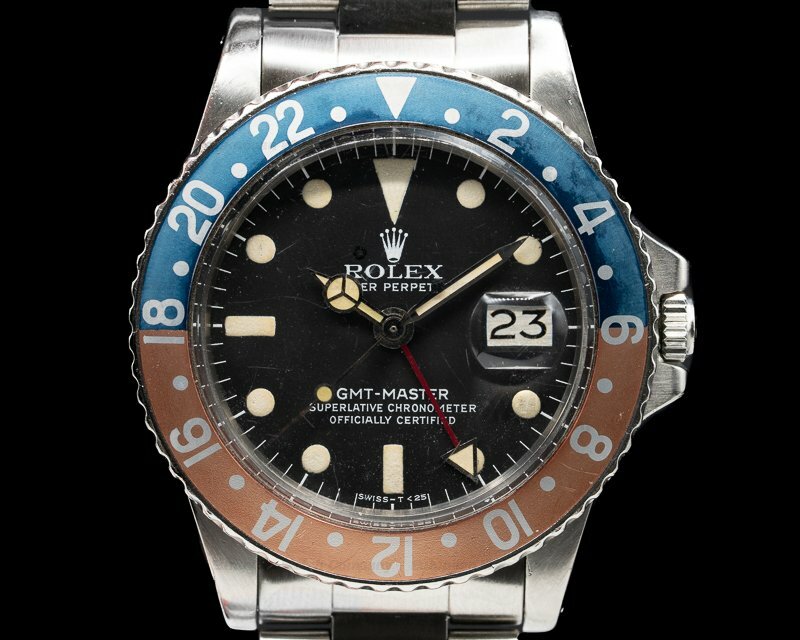 The Rolex Submariner 5513 was introduced in the early 1960's, and the earliest matte black meters first dials were produced in 1967.